EAST PIERCE FIRE AND RESCUE FIRE CHIEF DAN PACKER died July 26, 2008 in a wildfire in northern California. The 49-year-old chief had just begun a two-week assignment as a division supervisor overseeing wildland firefighters in the Klamath National Forest when the blaze suddenly blew up during a routine survey of the area. His loss has left a great hole in our hearts. To us, he was a respected chief, a valued teacher, a mentor and a friend. He was also a firefighter who loved his job. Chief Packer taught us that we shouldn’t expect the respect of the community just because we are the fire department. We have to earn it every day through hard work and a concentrated effort to provide excellent customer service. Since 2000, when the East Pierce fire district was formed, the words “Where Compassion and Action Meet” have been emblazoned on all the fire engines, medic units and support vehicles. For Chief Packer, it wasn’t just a motto, it was an expectation. As a leader, people were drawn to Chief Packer. They trusted his judgment and tried to emulate him. He had a great sense of humor and never took himself too seriously. One of the reasons he was at the California wildfire that claimed his life was to gain experience that would help in our community’s emergency preparedness plans. As a member of an Incident Management Team, Chief Packer was providing management support on a major wildfire. He and other senior staff members at East Pierce participate on these teams not only to help others, but just as importantly, to bring back valuable experience in case of a large-scale disaster in our district, such as an earthquake or lahar. Chief Packer was extremely proud of East Pierce Fire and Rescue. We are grateful that he provided us with a strong sense of mission. It has helped us move forward despite our grief. Today, we renew our commitment to serve you, the citizens of our district, with distinction and honor. We know Chief Packer would be proud. Dan Packer was born August 12, 1958 in Havre, Montana. As an only child, he shared responsibility for the family ranch and developed an ambitious discipline that served him well throughout his life. As a young man, he rode bulls, roped cattle, and was well-liked for his sense of humor. At age seventeen, he moved to the Seattle area for his senior year of high school where he met his future wife, Marylee. While they did not date at the time, they were very good friends. Those early years laid the foundation for their 28-year marriage. 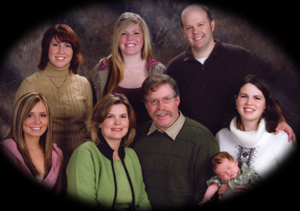 Dan and Marylee married in 1980 and had four daughters. Dan enjoyed being a father and took his responsibilities as a parent seriously. His daughters greatly admired and respected him. For all his gruffness, he was a softhearted man who doted on his family. Dan began working for the fire service in 1981. 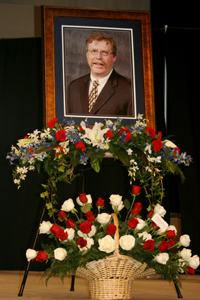 He served the first fourteen years of his career in Burien. In 1994, he accepted a position as battalion chief of the Bonney Lake Fire Department. He was named Chief in 1995. As the chief, he facilitated the creation of East Pierce Fire and Rescue – a successful merger of several smaller departments. His vision for the department and its service to the community was very large, and it showed in how he approached his work. In 2004, he assumed the presidency of the Washington State Fire Chiefs, a position he retained until July of 2008. In 2006, Dan’s first grandchild was born. Together with Marylee, he spent a great deal of time with his grandson, often having sleepovers and recruiting his “little shadow” to help with projects – such as washing the car and mowing the lawn. His devotion to his children and grandchildren was surpassed only by his love for his wife.